You can count on the TRACKER 500S to give you the essential features to get the work done. 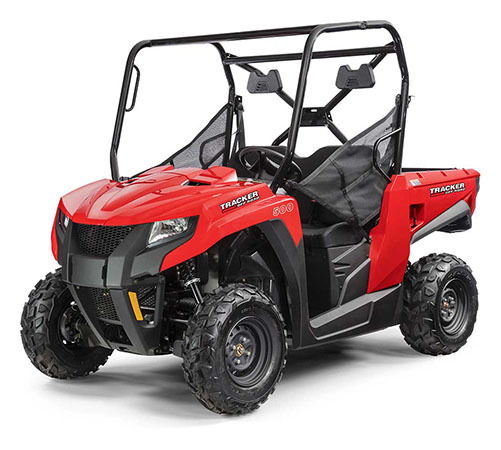 Best-in-class enclosed storage and multiple tie-down points add utility to its 500 lb. payload bed and 1500 lb. towing capacity. Compact and nimble, it sports a 72 in. wheelbase and 56.4 in. width for easier access through tight places where you go to work, hunt, fish or play. STORAGE COMPONENTS: Under Hood Storage, Glove Box, Cargo Dump Bed. SAFETY: 3 Point Seat Belts (2 Front), Seat Belt Speed Limiting, Door Nets, Steel Tube ROPS, Headlights, Brake Lights, Passenger Grab Handle.